Hi everyone! Today, I would like to share with you the second challenge called "The Body Beautiful" where you feature something from the human body. I chose to feature some fingers! I've decided to make a tag for today because who doesn't love tags. Hehe. No video today, sorry! But next one, I'll try :) It's just been a crazy weeks lately. 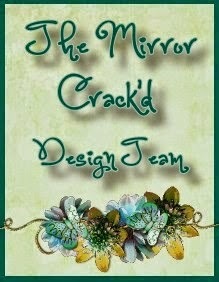 Don't forget to head over to The Mirror Crack'd Blog to check out the rest of my fellow DT members' projects. They are awesome! The winner of the challenge will a Guest Designer spot for the future challenge and the top 5 entries will be featured. Beautiful tag, Marina!! Love the colors. Great tag. Love the colour palette and all the frosted elements. Hi Marina, love the tag, the texture and the great choice of colours. This Tag is so lovely; the texture and the Palette suits the free hand drawing wonderfully.